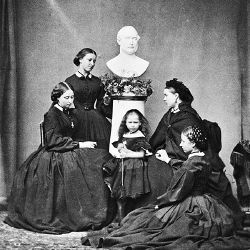 The five daughters of Queen Victoria and Prince Albert wore black dresses and posed for a portrait with his statue following his death in 1861. Mourning is in the simplest sense synonymous with grief over the death of someone. The word is also used to describe a cultural complex of behaviors in which the bereaved participate or are expected to participate. Customs vary between different cultures and have evolved over time, though many core behaviors remain constant. This reflects that natural desire for people to express their grief when a loved one dies, and their need to allow the passage of time before they can resume their usual life in society. Wearing dark, sombre clothes is one practice followed in many countries, though other forms of dress are also seen. Those most affected by the loss of a loved one often observe a period of grieving, marked by withdrawal from social events and quiet, respectful behavior. People may also follow certain religious traditions for such occasions. Mourning may also apply to the death of, or anniversary of the passing of, an important individual like a local leader, monarch, religious or otherwise influential figure. State mourning may occur on such an occasion. Traditions and beliefs related to death are an important part of human culture, and central to many religions. Belief in an afterlife, some form of continued existence after the death of the human body, is a common component of many religions. While the death of a loved one is naturally an emotional experience, faith and personal experience with the spiritual aspects of human life serve to comfort many in their time of mourning. As we grow to better understand that the purpose of our life transcends our time on earth, the sorrow of mourning can be transformed into a celebration of the transition of the loved one into their eternal life in the spiritual realm. Mourning is a type of behavior in which people typically express grief over the death of their loved ones. The extent to which people express feelings of sadness or celebrations of the deceased's life varies by culture. To many, mourning is a solemn affair in which one's behavior is rigidly regulated and outward using different dress or other visible symbolism. To others, mourning is an introspective affair during which people reflect internally on the lives of their loved ones. Periods of recognized mourning usually help to alleviate the grief one feels at the loss of a loved one as the ceremony and reflection serves as a catharsis. Mourning periods can mark the transition period from grief to getting on with one's life; they are also one final opportunity to pay one's respects to the departed. The custom of wearing unadorned black clothing for mourning dates back at least to the Roman Empire, when the Toga pulla made of dark-colored wool was worn during periods of mourning. Through the Middle Ages and Renaissance, distinctive mourning was worn for general as well as personal loss. After the Saint Bartholomew's Day Massacre of Huguenots in France, Elizabeth I of England and her court are said to have dressed in full mourning to receive the French Ambassador. 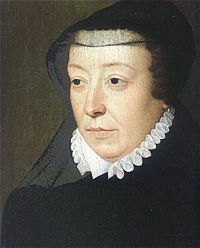 Women in mourning and widows wore distinctive black caps and veils, generally in a conservative version of the current fashion. 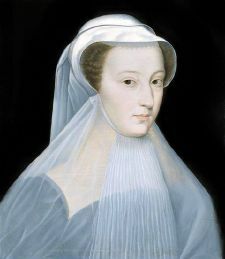 Mary Queen of Scots in deuil blanc c. 1559 following the deaths of her father-in-law, mother, and first husband Francis II of France. In rural areas of Portugal, Spain, Italy, and Greece widows wear black for the rest of their lives. The immediate family members of the deceased wear black for an extended period of time. The color of deepest mourning among medieval European queens was white rather than black. This tradition survived in Spain until the end of the fifteenth century, and was again practiced by the Spanish-born Belgian Queen Fabiola of King Baudouin's funeral. It was the custom for the Queens of France to wear deuil blanc or "white mourning"; this is the origin of the "white wardrobe" created by Norman Hartnell for Queen Elizabeth, later the Queen Mother, in 1938, when she was required to make a state visit to France while in mourning for her mother. By the nineteenth century, mourning behavior in England had developed into a complex set of rules, particularly among the upper classes. Women bore the greatest burden of these customs. They involved wearing heavy, concealing, black clothing, and the use of heavy veils of black crêpe. The entire ensemble was colloquially known as "widow's weeds" (from the Old English "Waed" meaning "garment"). Special caps and bonnets, usually in black or other dark colors, went with these ensembles. 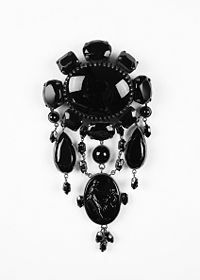 There was even special mourning jewelry, often made of jet or marcasite or the hair of the deceased. The wealthy could also wear cameos or lockets designed to hold a lock of the deceased's hair or some similar relic. Widows were expected to wear special clothes to indicate that they were in mourning for up to four years after the death. To remove the costume earlier was thought disrespectful to the decedent, and if the widow was still young and attractive, suggestive of potential sexual promiscuity. Those subject to the rules were slowly allowed to re-introduce conventional clothing at different time periods; stages were known by such terms as "full mourning," "half mourning," and similar descriptions. Friends, acquaintances, and employees wore mourning to a greater or lesser degree depending on their relationship with the deceased. In general, servants wore black armbands when there had been a death in the household. Mourning was worn for six months for a sibling. Parents would wear mourning for, "as long as they feel so disposed." A widow was supposed to wear mourning for two years and was not supposed to enter society for twelve months. No lady or gentleman in mourning was supposed to attend balls. Amongst polite company the wearing of simply a black arm band was seen as appropriate only for military men (or others compelled to wear uniform in the course of their duties); wearing a black arm band instead of proper mourning clothes was seen as a degradation of proper etiquette and to be avoided. Formal mourning culminated during the reign of Queen Victoria. Victoria herself may have had much to do with the practice, owing to her long and conspicuous grief over the death of her husband, Prince Albert. Although fashions began to be more functional and less restrictive for the succeeding Edwardians, appropriate dress for men and women, including that for the period of mourning, was still strictly prescribed and rigidly adhered to. The rules were gradually relaxed and acceptable practice for both sexes became to dress in dark colors for up to a year after a death in the family. Nowadays there is no special dress or behavior required for those in mourning and even the wearing of black at funerals is in decline. Mourning generally followed English forms. In the antebellum South, with social mores that rivaled those of England, mourning was just as strictly observed. The sequence in the book and film of Gone with the Wind in which the heroine Scarlett O’Hara scandalizes the attendees at a society ball by accepting Rhett Butler’s invitation to dance, despite the fact that she is in mourning for her late husband, accurately reflects the social customs of the time. Mourning could be quite expensive. At the end of L. Frank Baum's The Wonderful Wizard of Oz, Dorothy explains that she must return home because her aunt and uncle, living in rural Kansas in the depth of the Great Depression, can not afford to go into mourning for her. Huge taʻovala (waistmats) are worn at a Tongan funeral. Bark cloth, a rough traditional fabric, was worn in some communities to denote that family members were in mourning. White garments are also used; following the advent of Christianity, black garments were worn, following European custom. In Ethiopia, an edir (or iddir) is a traditional community organization in which the members assist each other during the mourning process. Members make monthly financial contributions forming the Edir's fund and they will be entitled to receive a certain sum of money from this fund, the rate of which varies based on how close the deceased is to the Edir member. The purpose for such payment is to help cover the funeral and other expenses associated with the death. In addition, female members of the Edir take turns to do the house work like preparing food for the mourning family and people coming to comfort them. Usually, the male members take the responsibility to arrange the funeral, erect a temporary tent to shelter guests who come to visit the mourning family. Edir members are also required to stay with the mourning family and comfort them for three full days. The wearing of black armbands by the Israeli Olympic team in 1976 to commemorate the attack on the team during the 1972 Olympic Games. A sports team may wear black armbands, or affix a black stripe to their uniforms, for a specified time period following the death of an owner, coach, teammate or (if the decedent is a high school student) classmate. A community wearing special-colored ribbons on a designated day or for a particular time period. For instance, the wearing of red, white and blue following the September 11 attacks. Observing a "moment of silence" and/or flying flags at half-staff following a death. This most frequently happens in conjunction with national periods of mourning (such as the death of a former or current Head of State or other notable leader). Uniformed employees who wear badges may place a black band around the badge when a fellow employee has been killed in the line of duty. A wedding ring, either the original or the dead partner's, may be worn for a period after the death. State mourning, or in the case of monarchies, court mourning, refers to displays of mourning behavior on the death of a public figure or member of a royal family. The degree and duration of public mourning is generally decreed by a protocol officer. It was not unusual for the British court to declare that all citizens should wear full mourning for a specified period after the death of the monarch, or that the members of the court should wear full or half-mourning for an extended period. On the death of Queen Victoria, (January 22, 1901), the Canada Gazette published an "extra" edition announcing that court mourning would continue until January 24, 1902, and directing the public to wear deep mourning until March 6, 1901, and half-mourning until April 17, 1901. All over the world, states usually declare a period of official mourning after the death of a Head of state. The signs may vary but usually include the lowering or posting half-staff of flags on public buildings. In contrast, in the United Kingdom, the Royal Standard is never flown at half-mast, because there is always a monarch on the throne. On the death of the Emir of Kuwait in January 2006, a 40-day mourning period was declared. In Tonga, the official mourning lasts for a year; only afterwards is the royal heir crowned the new king. On the other hand, the principle of continuity of the state must be respected. The principle is reflected in the French saying "Le Roi est mort, vive le Roi!" ("The king is dead, long live the king!"). Regardless of the formalities of mourning, power must be handed on; if the succession is uncontested, that is best done immediately. Yet a short interruption of work in the civil service may result from one or more days of closing the offices, especially on the day of the state funeral. A national day of mourning is a generic category for a day marked by mourning and memorial activities across the majority of a country's populace; such days include those marking the death or funeral of a renowned individual or individuals from that country or elsewhere, or the anniversary of such a death or deaths. They are typically either spontaneous reactions or specifically so designated by that country's government. In addition to commemorations of the death of an individuals, many would include Israeli's Yom HaShoah in remembrance of the Holocaust to be such a day. The European social forms described above are, in general, forms of Christian religious expression transferred to the greater community. Roman Catholic funeral masses today use the liturgical colors white or gold rather than the pre-Vatican II black, as a sign that the funeral represents a Mass of the Resurrection and, in that sense, is an occasion for joy. Christian Churches often go into mourning symbolically during the period of Lent to commemorate the sacrifice and death of Jesus. Customs vary among the denominations and include the covering or removal of statuary, icons and paintings, and use of special liturgical colors, such as violet/purple, during Lent and Holy Week. In more formal congregations, parishioners also dress according to specific forms during Holy Week, particularly on Maundy Thursday and Good Friday, where it is still common to wear black or sombre dress or, as mentioned, the liturgical color purple. Judaism looks upon mourning as a process by which the stricken can re-enter into society, and so provides a series of customs that make this process. The most known and central stage is Shiva, which is a Jewish mourning practice in which people adjust their behavior as an expression of their bereavement for the week immediately after the burial. In the West, typically, mirrors are covered and a small tear is made in an item of clothing to indicate a lack of interest in personal vanity. The bereaved dress simply and sit on the floor, short stools or boxes rather than chairs when receiving the condolences of visitors. English speakers use the expression "to sit shiva." Yahrtzeit, יאָרצײַט, ("Time (of) Year" in Yiddish) is the annual anniversary of the day of death of a relative. It is widely observed, and based on the Jewish tradition that mourners are required to commemorate the death of a relative. Mourners required to fulfill this observance are the children, siblings, spouses, and parents of the deceased. Mourning is observed in Islam by increased devotion, receiving visitors and condolences, and avoiding decorative clothing and jewelry. Grief at the death of a beloved person is normal, and weeping for the dead is allowed in Islam. What is prohibited is to express grief by wailing (Bewailing refers to mourning in a loud voice), shrieking, beating the chest and cheeks, tearing hair or clothes, breaking things or scratching faces or saying phrases that makes a Muslim lose faith. Loved ones and relatives are to observe a three-day mourning period. Widows observe an extended mourning period (Iddah), four months and ten days long, in accordance with the Qur'an 2:234. During this time, she is not to remarry, move from her home, or wear decorative clothing, jewelry, or makeup. In Hinduism, death is not seen as the final "end," but is seen as a turning point in the seemingly endless journey of the indestructible "atman" or the soul through innumerable bodies of animals and people. Hence Hinduism, prohibits excessive mourning or lamentation upon death, as this can hinder the easy passage of the departed soul towards its journey ahead. Hindu mourning begins immediately after the cremation of the body and ends on the morning of the thirteenth day. Traditionally the body is cremated within 24 hours after death, however the cremations are not held after sunset and before sunrise. Immediately after the death an oil lamp is lit near the deceased and this lamp is kept burning for three days. Hinduism associates death with ritual impurity for the immediate blood family of the deceased, hence during these mourning days, the immediate blood family must not perform any religious ceremonies (except funerals), must not visit temples or other sacred places, must not serve the sages (holy men), must not give alms, must not read or recite from the sacred scriptures nor can they attend social functions like marriages, parties, and so forth. Hence the family of the deceased is not expected to serve any visiting guests food or drink, and it is customary that the visiting guests do not eat or drink in the house where the death has occurred. The family in mourning are required to bathe twice a day, eat a single simple vegetarian meal, and try to cope with their loss. On the day on which the death has occurred, the family do not cook, hence usually close family and friends will provide food for the mourning family. White clothing (the color of purity) is also the color of mourning and many will wear white during the mourning period. On the morning of the thirteenth day, a Shraddh ceremony is performed. The main ceremony involves a fire sacrifice, in which offerings are given to the ancestors and to gods, to ensure the deceased has a peaceful afterlife. Typically after the ceremony, the family cleans and washes all the idols in the family shrine and flowers, fruits, water and purified food is offered to the gods. Now the family is ready to break the period of mourning and return back to daily life. Buddhists believe people are reincarnated after death until they are liberated from earthly passions, at which point people are said to have reached nirvana. Following a death, Buddhists hold a ceremony for the dead. The ceremonies aim to generate good energy for the dead in their new incarnation. There is an open casket at these to impart the important lesson of the temporariness of the body. ↑ L. Frank Baum and Michael Patrick Hearn. The Annotated Wizard of Oz. (Clarkson N. Potter, 1973, ISBN 0517500868). ↑ David K. Jordan, Wǔfú 五服: The Traditional Chinese Mourning Categories Retrieved April 28, 2015. ↑ Carole Kennedy, A Glance at the Canada Gazette: Past, Present and Future Library and Archives Canada Retrieved April 28, 2015. ↑ Cyrus Adler and Judah David Eisenstein. Jahrzeit Jewish Encyclopedia. Retrieved November 8, 2007. ↑ 5.0 5.1 On Islam Shari`ah Researchers, Islamic Way of Mourning the Dead. Retrieved April 28, 2015. All links retrieved October 25, 2018. Victorian mourning garb at Morbid Outlook. This page was last modified on 25 October 2018, at 20:56.